Pictured left to right are John Flohr, Easton Rotary Youth & Community Fund Board member; Steve Shearer, Easton Rotary Youth & Community Fund Board member; Don Buxton, Executive Director, Chesapeake Music; Jackie Wilson, President, Easton Rotary Youth & Community Fund Board; and Tom Lane, Immediate Past President of the Rotary Club and member of the Easton Rotary Youth & Community Fund Board. Chesapeake Music recently received a grant from the Easton Rotary Youth & Community Fund for its YouthReach Program. For further information about Chesapeake Music’s programs and musical offerings, contact Don Buxton at 410-819-0380 or visit chesapeakemusic.org. The 32st Annual Chesapeake Chamber Music Festival will be held from June 4 through June 18, 2017 on the Mid Shore. Caption: Pictured left to right are John Flohr, Easton Rotary Youth & Community Fund Board member; Steve Shearer, Easton Rotary Youth & Community Fund Board member; Don Buxton, Executive Director, Chesapeake Music; Jackie Wilson, President, Easton Rotary Youth & Community Fund Board; and Tom Lane, Immediate Past President of the Rotary Club and member of the Easton Rotary Youth & Community Fund Board. 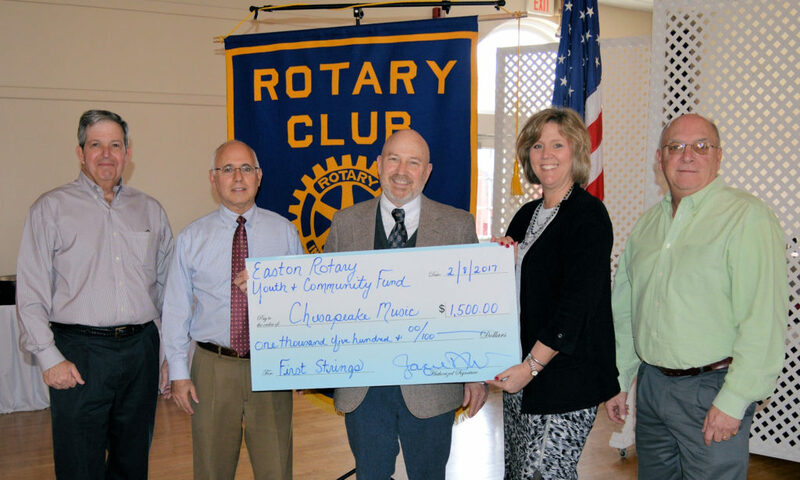 Chesapeake Music recently received a grant from the Easton Rotary Youth & Community Fund for its YouthReach Program.